This entry was posted in Book Reviews, Daily Blogs and tagged Consciousness, Eckhart Tolle, Ego, Impermanent conditions, sense of self, The Power Of Now by MomentumMikey. Bookmark the permalink. You sum it all up in a really great way. 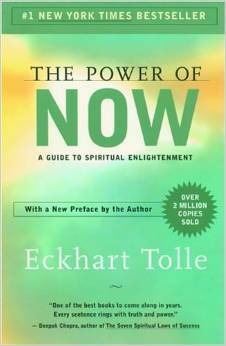 I read “The power of Now” six years ago and it was one of the big boosts to my awakening. I missed some contexts but after reading Wayne Dyer’s “Your sacred Self” everything was combined and clear. So I too can recommend Tolle’s book. And I’d suggest, check out “Your sacred Self”. If you loved “The power of Now” Dyer’s book will catch you! Thanks!!! I have a hard time listening to Dyer, as his EGO still is pretty apparent, but some of his books have been inspirational. I’ll give Your Sacred Self a read. and thanks for stopping by. I love learning from as many people as possible!! smile.